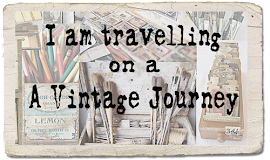 Hi everyone, Alison (butterfly) from Words and Pictures here, and I'm thrilled to be hosting the second challenge on this Vintage Journey. I'd like you to let the words take centre stage. 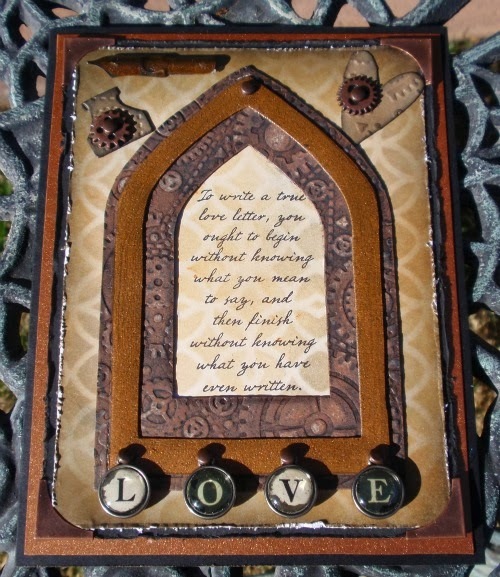 Tim Holtz makes it so easy to "say it with words". You could use one of the many fantastic sentiment stamps, or ChitChat stickers, AlphaParts, Grungeboard lettering (either pre-cut, or using the fabulous WordPlay die), or any of the other word/alphabet stamps, papers or dies you can think of, or all of them together! Whatever you pick, let the words be at the heart of your project. Words have always been central to my life (work and play). I love them for their meanings, their sounds and also for how decorative they can be. So there's decorative script stamping here, a sentiment which means a great deal to me, and the three large AlphaParts words on the tags which are there for their meanings, but also want to be said out loud! I was so inspired by Alison's "Words" theme. Words are so powerful and I particularly love so many of Tim's positive and encouraging sentiments from his stamp sets. I have created this inspirational mini book from three manila folders. 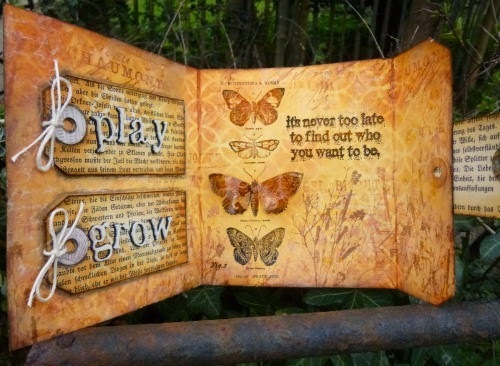 Every page has been transformed by various papers, distress inks and paints, stamps, die cuts, tissue tapes, alpha parts, stickers and lots of techniques to encourage you to try something new and different. Vintage through and through, this mini album is made with love from me to you! 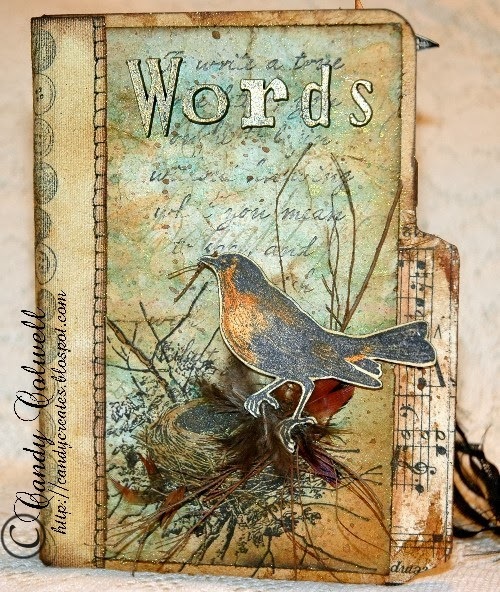 'Words' is such a fab theme for a challenge and we all know that between Tim's stamps, Paperie, Idea-olgy etc we have a wealth of products and options to draw from! For my triptych I decided to focus primarily on using his word stamps, dies and paints with some script backgrounds and 'zipper pull' wordy accoutrements! There's lots of blending and distressing on his journey. I loved the theme of "Words" and as there is nothing that I like better than making little books I decided to make one to have lots of space for quotes and sayings. I followed Tim's tutorial on making a W book and used some of the wonderful new papers, and of course I used stamps, inks and lots of ideaology bits and pieces and collaged to my heart's content. There are even some little pockets for tags. I also love making little books and I thought this would be the perfect theme for showcasing the many stamp quotes and sayings I seem to have collected lately. I made this little book from a single sheet of 12 x 12 paper following Tim's tutorial for his Valentine's book. I used up a lot of scraps and inked tags to decorate it - inside and out and finished the front with Tattered Pinecone Flower. 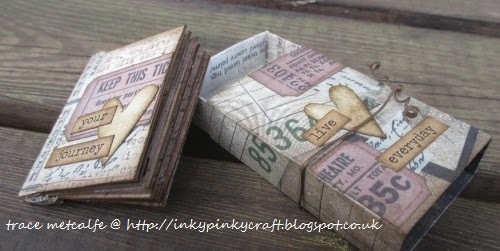 The link to Tim's tutorial is on my blog along with lots more pictures. 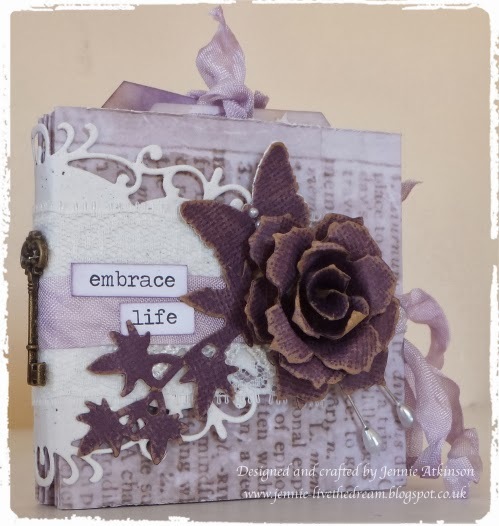 I have made a card today and used the wonderful Wallflower Stash as my main background, I have added the sentiment stamped onto kraft which has been inked, masked and stamped before given a coat of gloss matte medium. Can you spot an additional little feather? Guess where that came from? There are so many of Tim's 'words' that you can use for this challenge, I hope you will travel this stage of the journey with us. I decided my word would be "Love" as there can never be enough of that to go around! The sentiment is from my new "Nature Walk" stamps and I also had an inky play with my new "Lattice" stencil and some new embellishments. The arch frame is painted with Distress Metallic paint and distress and a light sanding, don't want to remove all that metallic. 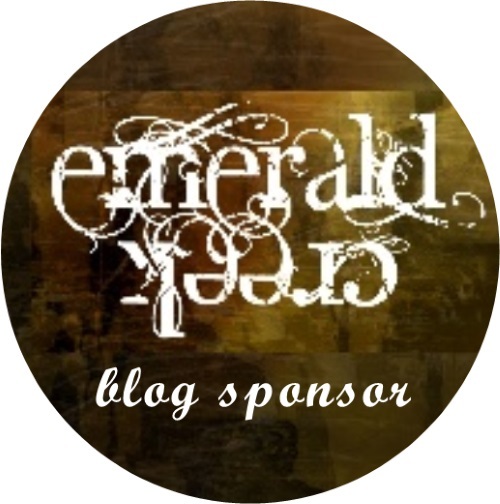 For Alison's wonderful 'Say it with words' challenge I wanted to make an extended tag to incorporate my enjoy the journey die and my umbrella man die, both of which are new. I used Distress Stains for the background and then used Tim's new Speckles stencil and some stamping to create some interest. Well I decided to choose lots of words that mean something to me on my journey. 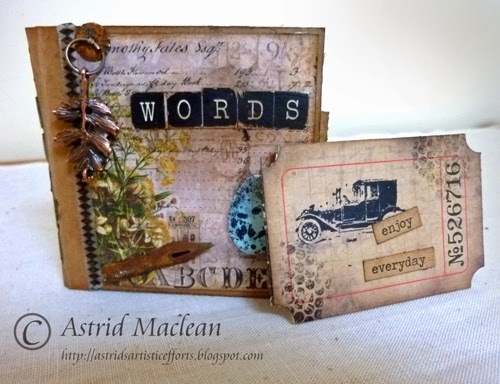 I couldn't resist making a matchbox using my new die and created a little mini book of words to fit inside.I used lots of the ephemera packs and lots of chit chat stickers for my little words book. It may be small but it is packed of Tim inspired goodness! Hi Everyone. 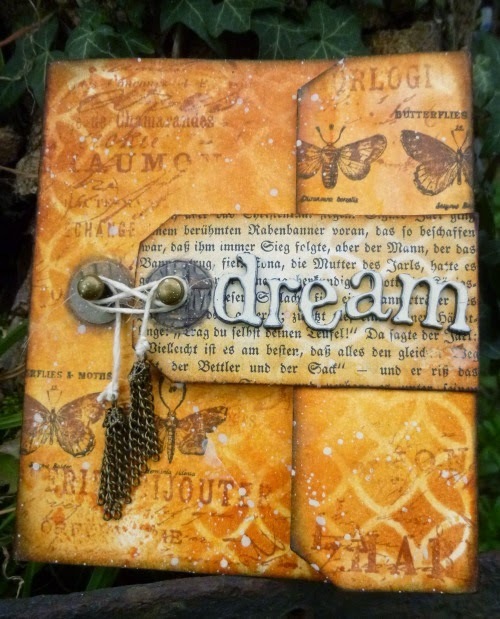 I am sharing a 10" by 12" canvas board, which incorporates many Tim Holtz products. I was inspired by Alison's 'Words' theme and my newly purchased Idea-ology 'Found Relatives' to create a nostalgic piece. As usual I had no particular idea/layout in mind, but had great fun making it. The background was created using Tissue Tape, Distress Paints, Distress Inks and texture paste through some TH stencils. The letters are mainly from some TH 12" by 12" papers that I have had in my stash for a long long time, you can also see some of Tim's Alpha tiles, which give that variation in size. I think you'll agree they're amazing projects, and I hope they'll inspire you to play along this fortnight. Please read the Travelling Instructions to check you will be eligible to win the £10 voucher from Country View Crafts. You have until 6pm UK time on Thursday 3rd April. Love the challenge theme and the samples... Now I just need to find the time to play! Wow, I love the superior DT inspiration and I can't wait to play along with your second challenge. Terrific theme Alison. :) Woo Hoo!!! fabulous are all this amazing projects Ladies!!! Gorgeous projects from the DT - really hope to get time to play along with this one!! Great theme and inspiration from the team - the wallflower paper stash is now on my wish list!! Off to give it some thought! hope I'll be able to participate this time! Thanks Alison for this new theme and what various and inspireful interpretations from the DT!... I'm going to play again! Just love the DT samples. What a talented team you are. 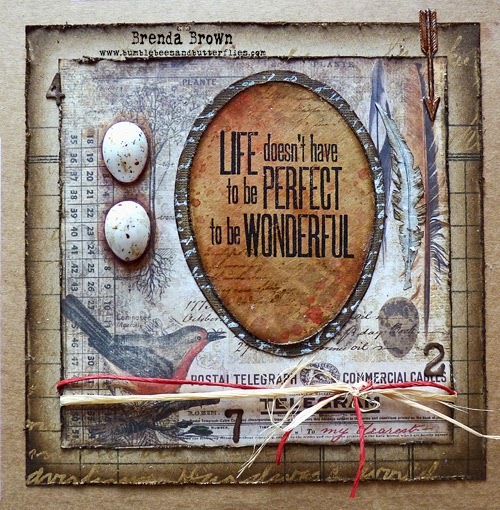 Great theme Alison fabulous inspiration will be popping round to the DT blogs to take a closer look, back later to play! I PLAYED, I PLAYED!!!!! Love all the DT's awesome work! It inspired my WORDS!!!! More gorgeous projects from each of the team, best get my thinking cap on for a good word or 2! I made it, whew! 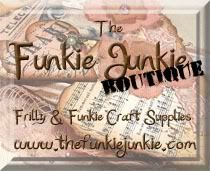 Maybe I can get my second project finished in time but at least I'm two for two here at AVJ, yay! Great projects from the DT - I love how they are all so different!! So sorry I messed up.... I didn't read the challenge properly :-D !!! Another great challenge and inspiration. Can we enter more than one Brenda? I want to play again. I read your rules I saw enter as often as you like? I just want to be sure I'm understanding I can enter the same challenge more than once? Last minute Charlie here. I have just managed to get mine done. Wonderful samples from the DT, and some great ones from the participants. Will try to get round to looking at them.